Combine onion,cilantro n lemon juice n keep aside until use. Heat oil in a kadai/pan, add cumin seeds n wait till splutter. Then add onions and saute till it turns translucent and add ginger garlic paste n saute until raw smell leaves. Then add chopped tomatoes(carrots, if using) and saute till it turns soft n mushy. After that add kashmiri chilli,cumin n garam masala powder, stir fry for 1-2 minute. Now add coconut milk n 2 tbsp water and bring to boil. Once it starts boiling add chopped cilantro and cook unitl the curry thicken. That's it...Curried chickpeas/Chickpeas curry is ready . Heat a tawa/griddle, pour a ladle ful of batter and spread in circular motion..make it thin crepes, as thin as possible. Drizzle oil around the dosa n Wait for 2 minutes to cook dosa, then take 2 spoonful of curried chickpeas in the center, sprinkle onion-cilantro-lime mixture, fold the dosa n serve hot. That's it...Curried Chickpeas Masala dosa ready. Enjoy with Coconut chutney / Sambar or as such. I used dry chickpeas, so soaked it overnight, then pressure cooked before use. In the step wise pic, i added few finely chopped carrots along with tomatoes but i forgot to add it on second time, so in the final pic carrots missing...you can also add carrots n other vegs to make it even more healthy n tasty. With the above mentioned quantity you can make around 7 curried chickpeas masala dosa. Adding lemony cilantro- onion is optional but it gives nice flavor n taste to the dosa. 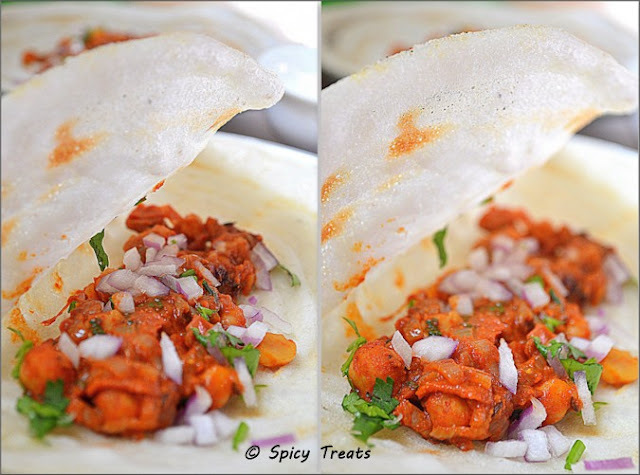 You can even have this curried chicpeas with chapathi, n enjoy it as chapathi rolls! Rendu dosa parcel pannunga udane Sangee, super super masala dosa. Seriously am inviting myself to ur place..
Looks so bright and lovely!.. Super tempting dosa and mouthwatering presentation! no words to explain.. got stun with the snaps :) excellent and really awesome..
Looks mouthwatering! the dosa seems so crispy!! Love it! Very cool idea. chole in dosai. I am sure I will love this combination. Such mouth watering clicks. Great n amazing. Loved the look of the dosa...yummy! Such an innovative masala Sangee....the color of the masala is too good. I'm gonna try this one for sure. Love your effort in explaining it step-by-step....good work. wow..very innovative.Looks yummy n mouth watering clicks. Looks so tempting and delicious,I too love have stuffed dosas like you.The channa masala got such a brilliant color,loved that color and your pictures make drooling and craving for it.Nice recipe dear..
Love that Fiery-Red Color!!!!! Different n Yummy Stuffing!!! yummy n filling masala dosa, looks so wonderful!! Umm simply delicious! Digging that stuff dosa. Never tried dosas with chickpea stuffing. It looks so colorful.